DAVIS, California -- Two groups of small fish, one from a Caribbean island and one from the Yucatan peninsula of Mexico, exhibit some of the fastest rates of evolution known in any organism, according to a new UC Davis study. eats other fish and another feeds on plankton. Sadly, these fish are now extinct in the wild and only found in labs and aquaria. The pupfish evolved changes to their jaws to match their specialized diet, allowing Martin to construct an evolutionary map for the species. If the evolution of all pupfish is like a steadily expanding cloud, Martin found that the San Salvador Island and Yucatan pupfish are like bursts of fireworks within it. 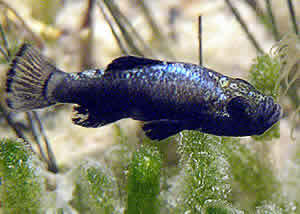 They show explosive rates of evolution — changing up to 130 times faster than other pupfish, he said. It's not clear why the pupfish in the two locations are evolving so fast. In both places, the lake water is hot and salty — but that's true in other places where pupfish live. And mosquito fish, found in the same two lakes, show no signs of rapid change. Martin is continuing his research by taking lab-bred fish, including hybrids, back to the lakes to see whether they thrive. He hopes to see which fish succeed out of a spectrum of hybrids. The research is published online in the journal Evolution. Martin is a National Science Foundation graduate research fellow. Aussie shares wave with monster Great White!